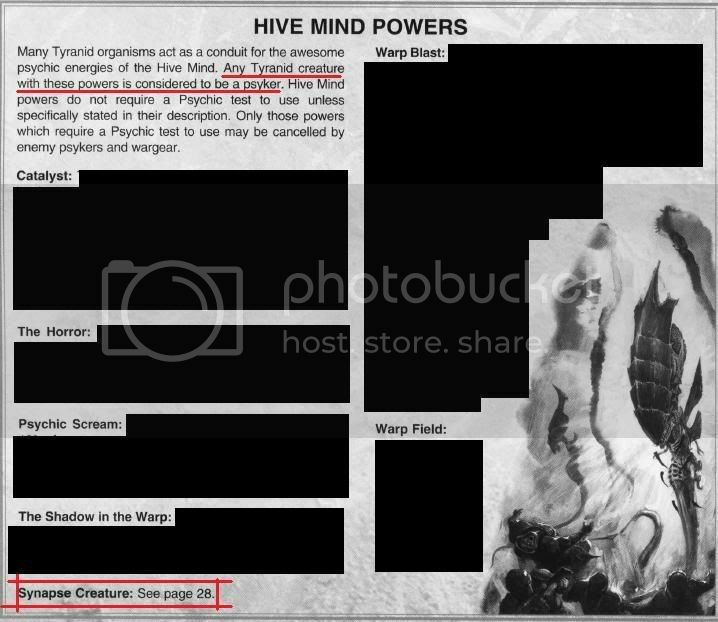 Warhammer 40k Forum Tau Online » Warhammer 40K Armies » Tyranids » Synapse creature = Psyker? Am I correct in this theory? There are several people who say yes and others who say no. This will influence my decision to take a Calexus Assassin in my =I= list. Re: Synapse creature = Psyker? Anything with the word psyker in their profile counts as a psyker. A psyker will have a psychic power, right? What is synapse? A psychic power. In almost all cases, I&#39;d call Tyranid synapse creatures psykers, Zoanthropes included even though they have Warp Field. I mean come on... a Zoanthrope is a giant floating psychic brain. It&#39;s definitely a psyker. Not sure of the wording on this, it&#39;s been all switched up with 5th but I&#39;m pretty sure in 4th Edition Nids with any form of psychic/synpase power were psykers. My point is relevent to the Tyranid codex on page 28. Here is a scan of what I am referring to. The underlined part at the top refer to synapse being psyhic fluff wise. The section down the bottom refers to Synapse as a power. The red underline is where the question arises. the rule does not say &#39;...or psychic powers...&#39; It says &#39;...or other psychic powers...&#39; Which in context would make synapse a psychic power (albeit generally passive). Am I correct in assuming that all Synapse creatures are essentially psykers? Now I&#39;m pretty sure that, that tells me Synapse is a psychic power and that a creature with it is a psyker. I am removing your first scan though. Too many rules are present. "All of the organisms that can channel the commands of the Hive Mind are potent psykers, and communicate with their brethren not by language, but by a kind of instinctive telepathy." But I think the question is answered definitively with pg31 that you showed above, specifically with the sections you outlined in red. I&#39;ve always played Synpase creatures as Psykers. I think the rules are pretty clear that they are.